Turkey downed a Russian fighter operating in Syria, which raised fears of a broadening conflict, and placed two of the world's most headstrong leaders on what seemed like a collision course. Meanwhile, despite his roots in the country’s traditionally anti-Zionist left, Greek Prime Minister Alexis Tsipras paid a short and warm visit to Israel. So did Cypriot President Nikos Anastasiades. When visiting Israel, Tsipras went so far as to recognize that Jerusalem is, and will continue to be, "the eternal capital of the Jewish People" (while offering similar recognition to the putative Palestinian "state"). Both these visits, as well as the Russian conflict with Turkey, reflect – directly or by inference – aspects of the growing cost of Turkey's vaulting ambitions under President Erdogan and Prime Minister Davutoglu. Whether or not the term "neo-Uthmanism" serves any explanatory purpose, there was clearly an open bid by Ankara in recent years to use the regional turmoil, the so-called "Arab Spring" (perhaps the mother of all misnomers…), as a springboard for the assertion of Turkish leadership and even hegemony. This was shaped by the ideological imperatives of the AKP leaders and their sense of affinity and obligation towards the Muslim Brotherhood and its offshoots, such as the Hamas regime in Gaza. As Syria descended into civil war and disintegrated, Erdogan – who once upon a time tried to position himself as Bashar Assad's friend – turned into a stern supporter of the insurgency. Even if one doubts the claims of Turkish-Islamic State connivance now put forward by the Russians, there is reason to believe that the relevant Turkish agencies were not too choosy when offering help to Assad's various enemies (including the buying of oil and gas from rebel-held areas). Meanwhile, Turkey sustained her traditional nationalist stance towards the Cyprus question, and tensions with Greece did not abate. The results are now very much in evidence. As has been said all too often, from Davutoglu's promise of "zero problems with the neighbors" the road led very quickly to "zero neighbors without problems." However, the escalation of Russian-Turkish tensions need not be taken too far. Neither President Vladimir Putin nor Erdogan seem to desire war, despite the bravado and the sanctions. Some opportunities for sober dialogue are now being set up (despite Putin's refusal to meet his Turkish counterpart in Paris). The long shadow of Turkish policies, however, is never too far away. Israeli awareness of the potential benefits of closer association with the Hellenic world grew exponentially after the collapse of Israeli-Turkish relations. The same could be said for the other side of the coin: For many years, Israel's image as Turkey's friend and military ally did little to endear her to Greek and Cypriot public opinion. This changed almost overnight after the Mavi Marmara incident, which made manifest to all a breach that has been brewing for some time. At the most obvious level, this realization on both sides was reflected in the welcome extended by Cypriots and Greeks to tens and even hundreds of thousands of Israelis who were no longer willing to avail themselves to "all included" Turkish hospitality in the Mediterranean resorts such as Antalya. If reactions to the change of government in July 2013 are the litmus test of ideological affinities in the region, then Israel, Cyprus and Greece have all aligned themselves on one side in favor of the al-Sisi government, while Turkey is on the other side (still refusing to recognize the legitimacy of Mohamad Morsi's removal from power, and in 2014 conniving with Qatar to control the endgame of the Israeli confrontation with Hamas so as to wrest this important lever away from Sisi's Egypt). 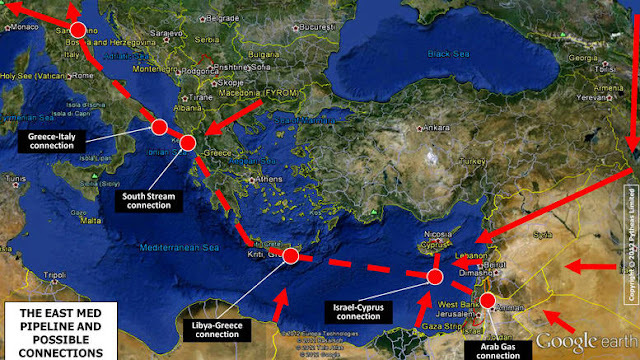 There is a "variable geometry" Mediterranean strategy. Greece and Cyprus will be joining with Egypt on December 9 for another tripartite summit, this time in Athens. Greek and Cypriot cooperation with Israel flourishes; and once Israel resolves her internal wrangles over gas production, there will be growing prospects for energy cooperation. What the Israel-Greece-Cyprus alliance does do is seek to block Erdogan's ambitions of regional hegemony, while at the same time offering Turkey a key place in the new Mediterranean political order, if and when she comes to her senses. As the leadership in Ankara settles down for a sober assessment of recent events – and seeks to strengthen its position within NATO and with the EU – the prospects for such a transformative change may well improve. Col. (res.) Dr. Eran Lerman is a senior research associate at the BESA Center. For the past six years he served as deputy for foreign policy and international affairs at the National Security Council in the Israeli Prime Minister's Office. For 20 years prior to that, he held senior posts in IDF Military Intelligence, and also was Israel director of the American Jewish Committee.